Police Commission chair Thomas Smith has come under fire for his decisions. "People fell into patterns of 'this is the way we should do things,'" she said. "We ended up replicating problems." One consequence was the dismissal of a proposal by Commissioner Mike Nisperos at the first meeting to possibly rotate the position of commission chair. Instead, the commissioners voted to appoint Thomas Lloyd Smith as chair and Ginale Harris as vice chair. When the Express requested an interview with Smith for this story, he asked for a list of questions before agreeing. After I sent him some questions in an email, Smith declined to be interviewed. Harris didn't respond to an interview request. 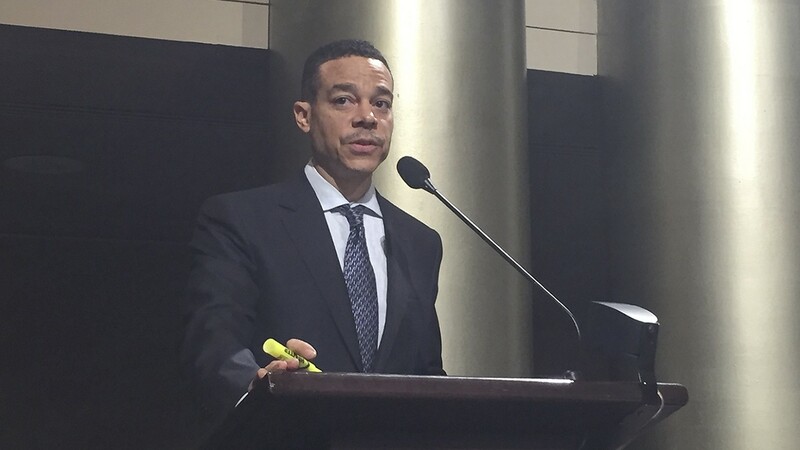 Smith has a sparkling résumé, including having graduated from Harvard Law School, but he fumbled badly as chair during some of the commission's early meetings. Votes were taken improperly; public comment was skipped over. During one meeting, Smith refused to allow the alternate commissioners to sit at the dais with the full commissioners and join in discussion. Later, after requesting legal advice from the commission's attorney, he relented and allowed the alternates to sit with their fellow commissioners, but the episode had created a sour atmosphere. In March, Smith made another mistake by appearing at a West Oakland scene of an officer-involved shooting and speaking to the media. Members of the Anti Police-Terror Project, an activist group skeptical of the police commission from its inception, denounced Smith for what they characterized as an appearance and statement that only parroted OPD's talking points. Smith was also criticized by his fellow commissioners who said his behavior jeopardized the commission's role as a neutral factfinder. If at a future date, the commission decided to hear evidence about the shooting and possibly impose discipline on an officer, Smith's appearance and public comments at the scene could imperil that. It made him a witness to the aftermath of the incident and less an objective official to hear evidence. "You need to stay neutral while your investigative agency goes to the scene," Mary Vail, a member of the Coalition for Police Accountability, told the commissioners at their meeting immediately following the shooting. But at the time, the commission was nowhere near being ready to conduct a discipline committee hearing, should one arise from an earlier incident like the shooting in question. It was only in October that an ad hoc committee of the police commission first presented a plan to train all of the commissioners on how to conduct a discipline committee process, with trainings only then being scheduled. Tellingly, it was up to the commissioners themselves to organize these mandatory training sessions to prepare them for their most fundamental duties. They received very little assistance from Landreth and the city administration. Part of the reason for the commission's chaotic start was a missing crucial piece of legislation known as the "enabling ordinance" that spells out the commission's responsibilities and powers in detail. Without the enabling ordinance, the commission lacked a work plan, and it couldn't make progress hiring some of its key staff, especially the inspector general, a position that was created in the enabling ordinance rather than Measure LL. Although councilmembers Kalb and Gallo introduced a draft of the enabling ordinance in January 2017, the city council didn't approve a final version until July 2018. The lengthy, 18-month delay was partly due to City Attorney Barbara Parker's opinion that the city needed to meet and confer with the Oakland police union about the ordinance. Grinage and the rest of the Coalition for Police Accountability believe that the city didn't need to spend nearly a year in private talks with the Oakland Police Officers Association about the enabling ordinance. "The fact that the city took as long as it did to pass the ordinance was a problem," she said. Grinage noted that state law requires cities to meet and confer with their employee unions when they consider changing wages, hours, and other terms and conditions of employment. "I couldn't imagine any aspect of the ordinance that touches on those features," she said. But the ordinance was also delayed due to numerous disagreements among councilmembers, activists, and police commissioners over details buried in it, the full implications of which are still unclear. The biggest disagreements regard how much power the city administrator and city attorney have over key commission staff positions. City Attorney Parker didn't respond to an interview request or a set of emailed questions sent to her and her spokesperson Alex Katz for this story. But Parker's deputy attorneys have made the point repeatedly in public meetings that under Measure LL and the city charter, legal advisors to the CPRA and to the police commission will be appointed by Parker, and she's only required to consult with the commission about who to pick. Parker hired an outside attorney to argue this point during a city council meeting last July, after it became apparent that some councilmembers wanted to give the commission direct and sole authority to hire its own legal counsel. Karen Getman of the Remcho Johansen & Purcell law firm told councilmembers at their June 20 meeting that "the city attorney is the only attorney for the city," and "city boards and commissions don't have any independent authority to appoint their own advisor." The final enabling ordinance conformed with this view, but some believe this creates a potential conflict of interest in that the legal advisor to the police commission, which is tasked with uncovering police misconduct, is appointed by and can be fired by the city attorney. At the same time, the city attorney defends cops when they're sued for misconduct and is generally responsible for protecting the city against the exact kinds of scandals the police commission and its investigators will be attempting to uncover.